Valerie, I just love your posts. Valorie, thank you so much, that is such a lovely comment, as you would know, from one writer to another… much appreciated..
Cindy, thank you, I really appreciate you reading and commenting, . Lovely, Valerie. I agree- we are losing these tangible reminders, however small and inexplicable they may be to others, as we take snap shots to be uploaded or deleted on a whim. I have a box of similar items that I value among my most prized possessions. I think I might need to pull it out and have a trip down my own memory lane. Thank you for the wonderful prompt to do so. I have been working on a post about a little collection I have that holds meaning for me, so I was very interested in the memories attached to your collection and to those attached to your brain! My Grandmother had ‘The Prophet’ sitting on her bookshelf from my earliest memory of her house. The salad sounds wonderful and I have a fresh head of cauliflower… Thank you! So good to hear from you, and so glad you enjoyed the post – and hope you enjoyed the salad! Interesting how The Prophet has been around in all our lives and memories…. Hello Dee, thank you so much for your comments – so glad you enjoyed the post – you’re right, those passport photos seem to capture all our insecurities ! Lovely to know you enjoyed the quote – Gibran is so good to come back to after a long break ! Passports , feathers and rocks – the ties that bind us !!!! You certainly gave me food for thought over your prophesies about the internet !!! Everyone has posted the comments I would like to write already. However, as my mind wanders through the collections I hold dear, I have a sinking feeling that those who follow on will never grasp the beauty, richness and value of these small insignificant objects. I agree with Cecilia	that the internet will not surviving in its free state for very long. Whether that is by government regulation, I doubt. I think the change will come from millions of people who turn their backs to data-grab, privacy invasion, narcissistic over-sharing and all that. I admire you for still writing so much and such personal pieces. Ever since Snowdon broke the news, I suffer from a blog-block. Others too? I can’t get over the fact that Google even stores my own corrections to a text; that they are interested in self-correcting or self-editing. They are building psychological profiles and I do not like that. Maybe you could write a post on how you, a writer, deal with this? I had no idea that Google stored information to that level of invasion of privacy. I’m gobsmacked. But I also refuse to be intimidated and to have my freedom of thought and action limited by fear. How do I feel? Completely powerless, as powerless as I feel about Syria, Guantanamo, Japanese hunting dolphins and whales, about fracking and clearing forests and poaching elephants, and all the other outrages we visit both upon the earth and upon ourselves. That is a good reflection, Valerie. I try to add some beauty, nature appreciation and mindfulness to the world. Indeed, I should not let ‘somebody’ take that intention away. Thank you and long-distance-hug to you. As always, my world is richer for having read more of your past that you so generously share. I, too, remember the old cameras. My father would have us pose while he looked down into the lens of the old box camera. I still have the albums with these precious black and whites. For years, from a young bride I kept impeccable photo albums. I have priceless photos of my sons’ births, their first birthdays, etc. Somewhere along the line, due to circumstances, I started tossing photos in a box, thinking that someday I’d have time to gather them and catch up with my album keeping. Alas, the photos still languish in a box. Like the rest of the world, my most recent photos over the past ten years are digital and “kept” on computer. I still don’t know when I’ll make time for the gathering. It’s a rather daunting prospect as out of hand things are. So, dear friend, I’ll wrap it up here with thanks for the nudge and food for the thoughts. Isn’t it interesting, what you describe sounds like so many of us… I even found, and others have agreed, that the careful collating of photos for the first child fell by the way with the added pressures of the next child! I’ve had similar thoughts, Valerie, about photographs. I have been collecting daguerreotypes for years, as I find them hauntingly beautiful. To stare into the eyes of someone posing in the 1870’s … I wonder about their life… the old photos are so detailed and beautiful. Today I struggle with how to even store the digital pictures. They tell me that the discs and hard drives will fade away as ‘old tech’ and be unusable, and that photos should be stored “in the cloud”. I dunno …. that reeks of “disappear” to me. My boxes of daguerreotypes capture the past. I think the cloud will dissipate it. Dear Kathie, how terrible that even hard drives and discs will become obsolete… I find technology a real pain , and have even given up TV because we have to up date ours for some technological improvement . Your collection of daguerrotypes sounds beautiful, and as you say will outlast all our flimsy records…. its rather sad isn’t it… there won’t be the memories for our grandchildren if we’re not vigilant. Going through old souvenirs is opening a bag filled with mixed emotions. Backward journeys are bittersweet. I especially like your reflection about our new way of taking and storing photos. It’s a question I ask myself often too. And I always keep every passport photo! It’s been an education reading people’s comments, I’ve learned a lot and am now even more fearful of everything disappearing after reading their knowledgeable comments. Hope your passport photos are better than mine !!! So good to hear from you Jade…thank you… hope you can track down those precious boxes of your family photos- they are irreplaceable , especially for children and grandchildren to know something of their heritage. Oh those awful, awful passport photos. The more advanced the cameras become, the worse the photos get. I am embarrassed to own that the person in my passport is me. Mmmmm……how to store, or preserve, our legacy/photos/jewels/treasures is a tricky issue. I keep things in different formats but it could all be lost one day. However, overall, I think enough of our ‘stuff’ will survive, in some form, to keep archaeologists and historians busy, as they always have been, trying to piece together the mysterious jig-saw of history. Most likely, a lot of what survives will be the detritus of life, but archaeologists love that too. You sound very upbeat about our survival Gallivanta… !!! Hope you’re right ! Isn’t it strange, my grandfather then my father then me, we were the recorders of our family history. I have an antique sea chest full of photo albums, boxes of photos that didn’t make the albums but are still the record of travels and family. I have all my grandfathers and fathers slides, movies, photos and negatives in boxes in a closet waiting for me to scan them, catalog them and save them. Though much of the art on my walls are photos I have taken, I have other collections as well, like you feathers, rocks and shells; collections with memories attached. I also have, like you a lifetime of old passports going back to 1964 and my first trip out of country when I was 7, I smiled and I was missing teeth. Valerie, you always remind and always ground us. Your gentle touch is soothing, thank you. Collections of stones, feathers and such are found in our household, as well. All treasured memories. Personally, I still like to see my photos in print and your post encourages me to create photo books more often. There are also wonderful possibilites to create such books online and have them sent to our homes, if we wish. LOvely to hear from you Steffi, isn’t it interesting how we can’t resist the things of the earth to ground our memories… we’re still quite tribal !!! There will always be feathers and stones and shells, which do an almost better job than the camera at recalling memories. 🙂 A wonderful reflection Valerie and your summer salad sounds unique! Yes, I’m the same, Margarita – they take the photos — somehow I never think of it, and anyway, it doesn’t feel the same on a computer to me! But I am glad I have all the albums of the my grandchildren to dream over…. Valuable treasures Valerie! As we get older, those memories get more and more precious to us! Beautiful collection! Re. 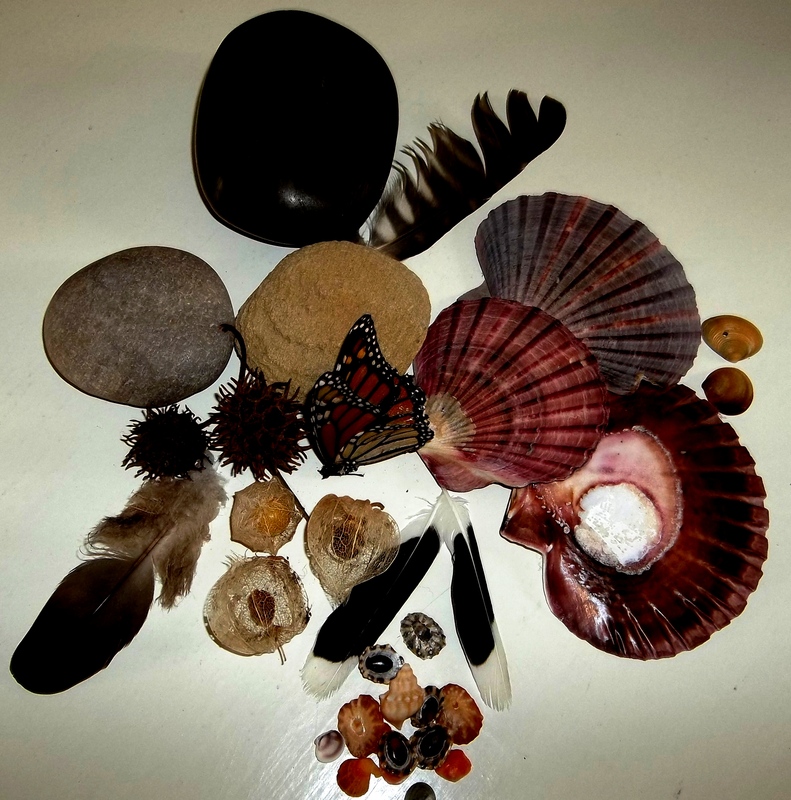 rocks, shells, feathers, etc: It is as if you were collecting evidence from the earth that you had a home here- because from childhood, so much was uncertain and unpredictable. People and circumstances could not be relied upon to provide you a stable home: but the earth itself – the earth is stable. Hello dear Claire, how lovely to hear from you, what an intriguing and rather romantic theory ! I love it, and think you have several points there! Actually I’ve also been fascinated by how many other bloggers also have their collections – no feathers or stones for you Claire?